"There are a lot of people who then devote themselves to their studies. If you ask me, I'd say that's like running away from society." "The Terror of Werewolf Castle Part Three: Detective"
Last time on Jinroujou no Kyoufu ("The Terror of Werewolf Castle")! All members of a party visiting the Blue Wolf Castle in France, 1970 were killed one by one by some mysterious force. A ghost? A Nazi-Werewolf? The Devil?! Meanwhile, in the Silver Wolf Castle in Germany, a twin castle to the Blue Wolf Castle, a similar series of murders is commited! Are the murders spread across these two castles related to each other?! You'll find out in the new chapter of Jinroujou no Kyoufu! Ok, you don't really find out in this book. There is still one book to go. 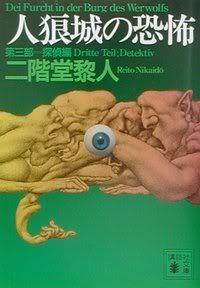 The third part, Detective (the cover says: Dei (sic) Furcht in der Burg des Werwolfs Dritte Teil; Detektiv), starts on a somewhat mystical tone, as Nikaidou Ranko (and her brother/narrator Reito) seem to be getting a lot of signs lately all pointing to Germany, indicating that there is something for them to solve there. This feeling is also confirmed by a mysterious request by the Church, who asks the Nikaidou siblings to go to France to solve a case for them, hinting at some sort of connection between their request and Germany. When they find a small newspaper article about a certain mass disappearance case in Germany though, the two are pretty sure that this is what is calling for them. Through a friend, Ranko gets hold of the terrifying report of a mental patient who is supposed to be the only survivor of the mass dissapperance, claiming that that the whole party was all killed in a place called The Silver Wolf Castle (see Part 1 Germany). Ranko and Reito make up their mind and take up a long-standing invitation of the French government to visit the country (for services rendered in the past) in March, 1971, as this would allow them to go to Germany more easily to look into the case. In the course of their investigation, it seems that someone has been cleaning up the loose ends of the case, as almost anyone who knew anything about the case seems to have died rather suddenly in the half year since the incident. The Silver Wolf Castle also seems non-existant. It’s almost a wonder that Ranko does get hold of a very important clue in the form of the diary of a certain laywer, who tells of a similar series of horrifying murders in the Blue Wolf Castle (see Part 2 France). With all the events in The Silver Wolf Castle and The Blue Wolf Castle known at this point, Ranko and Reito start to make progress in their deductions on the happenings in the Werewolf Castle, but it also seems that someone is watching them. With two And Then Were None scenario’s discussed in the previous two books, we finally start detecting here. Most of this book is made up by discussions by the main characters on how the events could have happened. Both Ranko and Reito are enthousiastic mystery readers, and indeed, I have to admit that the two constructed their theories in exactly the same way I did, by looking at what the events were and trying to compare it to similar events in other novels (which are referenced to often). Many of the theories proposed thus passed my mind too, but like them, at this point, I still can’t find an all encompassing explanation. It’s still bits and pieces, theories that work for this, but not for that. It’s just too big; locked rooms, the setting of the two castles, mysterious comments on the architecture of the castles, the similarities (and more importantly) the differences in the events In the two castles, the motive… the scale of this story is just unbelievable. I still don’t really like Ranko as a character though. She has more personality compared to Bara no Labyrinth ("Labyrinth of Roses") but I think the ‘problem’ I have with her is that is a lot like a Van Dine, really smart and good at everything that she does, but narrator Reito does little more than to confirm that. A sarcastic tone would have helped a lot on how Ranko is presented in the story. While Reito does, very occasionally, make a sarcastic comment about Ranko, most of his observations of her dwell on how absolutely fabulous her hair looks or what kind of dress she is wearing or how she crossed her legs before she spoke. Reito and Ranko are not blood-related (Ranko is adopted), but I am really sure how I’m supposed to read Reito. But there is only one book left! I’m still not totally sure how this is going to turn out (this part ends with a sort of a cliffhanger), but I’m quite confident that Nikaidou will finish this in a way worthy of the title longest detective novel in the world. I’ll try make the final review a more overall review of the whole series; I’m pretty sure that these single reviews don’t do justice to the scale of the whole story. And I’m mostly writing these partial reviews to serve as a reminder to myself on what happened anyway. By the way, I just plugged your blog big time, but had to rough up Kindaichi a bit before doing so. I can hardly be the only person who is surprised to see that your comment predates the post itself?